We often talk about our successes at PHW, but it’s important to remember that not every project or property we’ve set our sights on was able to be saved through our efforts. Here are a few “big fish” stories from 1963 to the early 1970s which did not bear fruit. 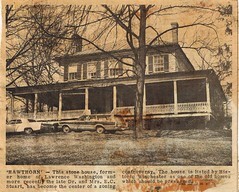 Some of the demolished properties which initially concerned the nucleus of PHW in 1963 included Dr. Baldwin’s stone office and the Cannon Ball House on South Loudoun Street, the Capper House on North Loudoun Street, the Chanticleer Inn on West Boscawen Street, and the Hollis House on Cork Street. 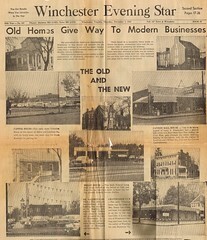 It appears that these properties were used as examples in the November 1963 meeting at the Handley Library, mentioned in passing in the January 24 post. Toward the end of the battle for the Conrad House, Hawthorn on Amherst Street was similarly being threatened with demolition for subdivisions for more Whittier Acres construction if the building could not be sold. Although PHW toyed with the idea of buying the property jointly with other civic organizations, the idea did not come to pass and the home was preserved through private efforts. Conrad House enthusiasts may be pleased to note the front porch now on Hawthorn was salvaged from the Conrad House. Also considered for purchase was the stone building at 15 South Braddock Street, as its location was no longer suitable for a dwelling and it could be adapted for office use. (7) Houses on Sharp Street were circled several times as being of interest to restore to provide more low-cost housing in the city and to retain for their historical and architectural value. (8) Properties on South Loudoun were also seen as potential purchases for similar restoration efforts. Word reached PHW about a possible City-led demolition of a log house at 502 1/2 South Cameron Street. None of the gentle inquiries or outright offers about purchasing these properties bore fruit. Next week, however, we will learn how PHW became motivated to start a revolving fund and become serious about purchasing endangered properties.